Don't get me wrong, I love modern conveniences and amenities, but I am nostalgic at heart. It took me a long time to come around to the ease of having a kindle. And even then I still buy my hard cover books when I find one I just love. There is something about seeing them grace the shelves of my bookcase and seeing their spines all line up. The same goes for watches. Although I am in a world of numerous clocks and technological devices to constantly remind me of the time, I always have a watch on. They are both functional and fashionable. As much as I enjoy wearing a watch I cannot believe I did not own a classic gold one with a black strap. This one from AIBI watches is the perfect choice for a classic watch that will go with everything and never go out of style. The crystal detail on the face adds a touch of glam to make the watch easily dressed up or worn casually. 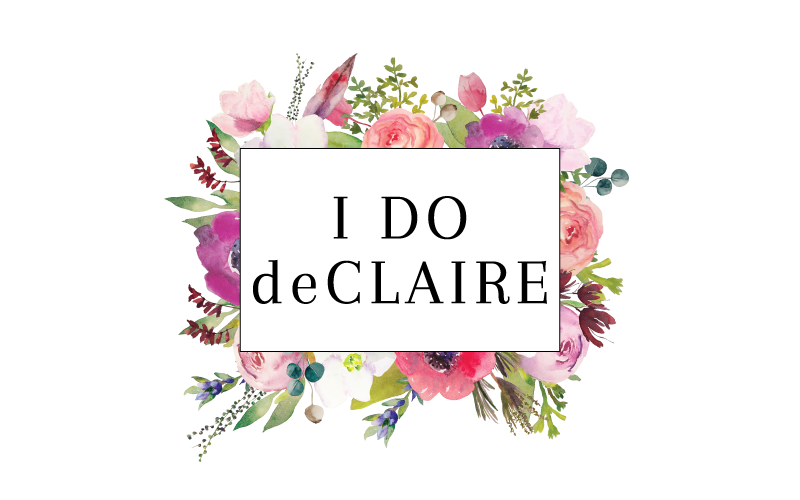 AIBI is offering a $20 off discount with the code DECLAIRE. It would make a wonderful Christmas gift, too! very cute and classic watch. great outfit! love the watch too--i see why you picked it! What a classic timepiece! 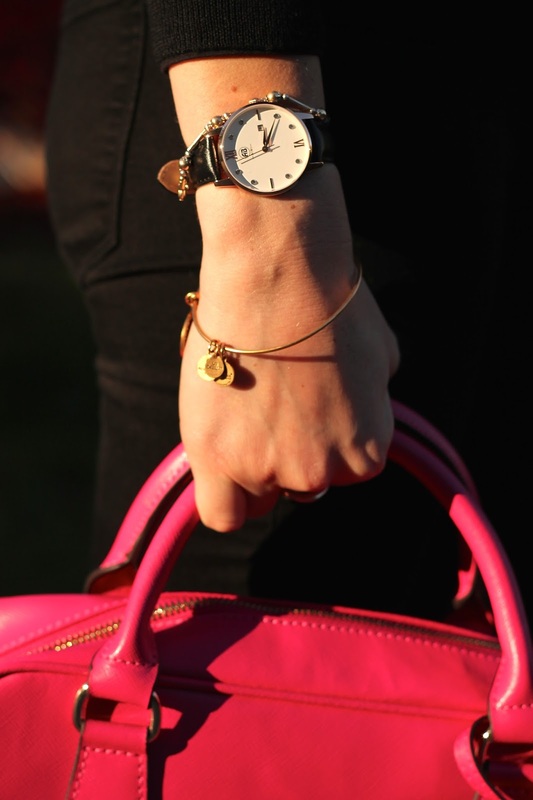 I always have to have something on my wrist - but I feel so much better when it's a watch rather than hair ties. That sweater is such a great piece! I love the hot pink accessories with it! Love the classic watch you picked! I'm trying to get back into wearing watches more often - stopped over winter as my watches are big adn bulky and don't work well with long sleeves, haha! I'm the same--I wear a watch every day! I honestly feel naked without one. This is a stunner! I love the classic design. Also your shirt + necklace combo is spot on. 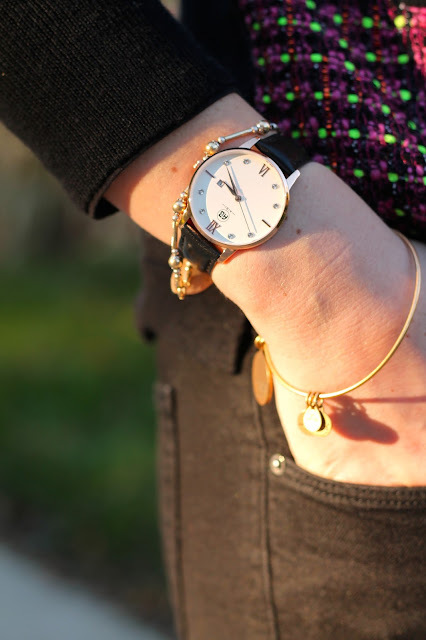 That classic watch is beautiful and it is nice that it will go with almost any outfit! I love wearing a watch everyday. I'm used to seeing such drab colours once fall hits, so your hot pink accents were such a refreshing sight! I'm a watch wearer and book buyer too. This looks like a great one! Beautiful classic watch. I used to wear mine more but I am now starting to wear them again. I agree that nothing beats a new book (especially a hard-cover one) or bookshelves full of books. What a nice watch! I also love hard cover books and have many of them. Your sweater is so pretty! I also love the bight pink bag and shoes! Have a great weekend! I should have written bright instead of bight. Sorry! Thanks for linking up to Top of the World Style. Nice watch. love your sweater, your watch is really pretty too! I do love analog watches, sometimes it's just a nice piece of jewelry that also serves a function, even if i forget and still look at my phone. Great sweater and pretty watch! You look lovely as always, Dear! Cute watch!! 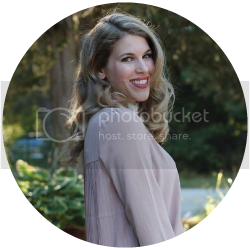 But like I've said, you've found really excellent pieces from Thredup. It's so fun looking around at the website, isn't it? This watch is a classic piece, you'll definitely get a lot of wear out of it. I love the sweater! I thought it was a tweed jacket at first, super cute! Great look, Laura! I wear a watch everyday. I'd even say that I feel empty without one on my wrist!! Glad you added a gold one to your line-up. It's such a classic. This sweater is so fun and love the yellow necklace paired with it. It really looks beautiful.I have a amazon account,so Itry to search this brand on amazon.To my surprise,they got store on amazon with many watches with a lower price.Might be I could try to get one from this brand on amazon.